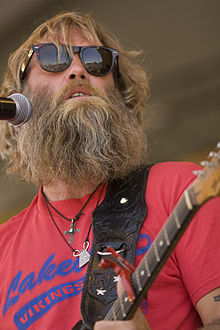 Anders Osborne (born May 4, 1966 in Uddevalla, Sweden) is an American singer/songwriter. He tours solo and with a band, and often plays in North Mississippi Osborne (N.M.O), a group formed by Osborne and North Mississippi Allstars. As a teen, Osborne started playing guitar and listening to Bob Dylan, Neil Young, Jackson Browne, and Joni Mitchell records. He was influenced by the vocal styles of Ray Charles, Van Morrison and Lowell George, Robert Johnson and recordings of African drumming. "Blues connected everything together for me," Osborne recalls. "The early rock, the R&B, the jazz, the singer-songwriters. Blues was like a thread running through everything." He began playing in Open D tuning, which gives his fretwork a signature sound and feel. "I first heard Open D on Joni Mitchell's Blue," he says, "and my fingers just fit the tuning." Osborne and his band toured the U.S. during these years and in 1995, he was signed to Okeh Records. He released Which Way to Here, an album that dealt with spirituality and tolerance. The record became Osborne's first commercial break with two top-five singles "Favorite Son" and "Pleasin' You." Both were featured in several Hollywood movies, and the latter was later recorded by Jonny Lang. In fall of 2014 and March of 2015, Osborne recorded album Spacedust & Ocean Views in New Orleans; it was released on March 18, 2016. His next album, Flower Box, was released on July 22, 2016. Both were released by Back on Dumaine Records. Offbeat's Best of the Beat Awards pay tribute each year to musicians who are voted best in a variety of musical categories and genres. ^ "NMO". 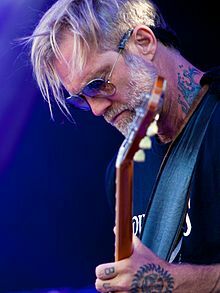 Anders Osborne. Retrieved 2018-06-04. ^ "George Graham Reviews Anders Osborne's "Living Room"". georgegraham.com. Retrieved 2018-07-11. ^ The possibility of performing with Osborne was what originally attracted Gotland-born Andersson to New Orleans in 1990. Spera, Keith (2012-05-01). "Letting life flow in: Songwriter Theresa Andersson's expanding roles with music and motherhood lead her to a better place". Times-Picayune (Saint Tammany Edition). pp. C1–C2. Retrieved 2012-05-02. ^ "Mad Dogs & Englishmen Tribute At Lockn' Festival". Jambase.com. 18 September 2015. Retrieved 21 November 2017. ^ "Relix Premieres Title Track from Forthcoming Anders Osborne Album, _Peace_". Relix. August 14, 2013. Retrieved 2018-05-30. ^ "Exclusive Song Premiere: Anders Osborne's "Liquor Drought" - C&I Magazine". Cowboys and Indians Magazine. 2017-09-07. Retrieved 2018-07-08. ^ ""Best of the Beat" Awards". www.neworleansonline.com. Retrieved 2018-05-30. ^ a b c d e f g h i j k l m "Best of the Beat Award Winners: Complete List". OffBeat Magazine. Retrieved 2018-05-30. ^ "Positive Vibrations HeartBeat Award (Musician): Anders Osborne". offBeat Magazine. Retrieved May 30, 2018. ^ "Nominees announced for 2018 Big Easy Music Awards". Best of New Orleans. March 26, 2018. Retrieved May 30, 2018. This page was last edited on 29 October 2018, at 01:30 (UTC).